Old world meets luxury comforts in the Historic French Quarter. French Quarter Mansion Boutique Hotel is a quaint luxury creole mansion located in the heart of New Orleans French Quarter. The “Decatur” is located on the first floor, facing Dumaine Street. The spacious suite with high ceilings can accommodate up to 6 guests and is equipped with a large private bathroom and wet bar. 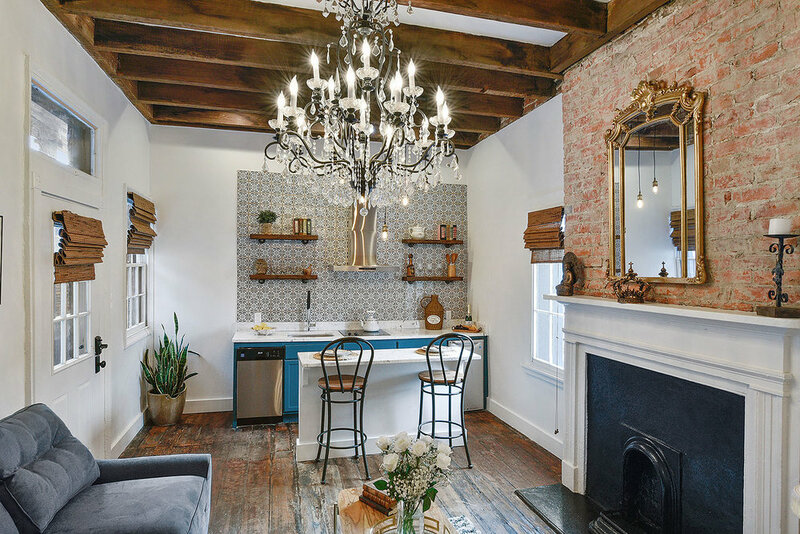 Located in the French quarter, this two-bedroom apartment with exposed bricks, marble and wood floors has a true historical feeling. This unit has view to the cozy courtyard. The "Bourbon" showcases a Victorian style décor and it showcases a dazzling five foot hanging Crystal French chandelier as well as an oversized balcony overlooking Dumaine and Bourbon St. The "Royal" unit is a charming two-bedroom equipped with three beds. It shares a common balcony with the neighboring unit next door to accommodate groups of 6 or more, combined. The "Chartres" room faces the courtyard on the 2nd floor. The soothing sounds of the water fountain can be heard from within the unit, offering a tranquil reprieve from the busy streets of The Quarter. The Dauphine Suite features French Quarter history at its finest. It is equipped with three beds, hardwood floors, a fireplace, bed crowns, silk drapes and a marble bathroom that will take you back in time to the glory days of French opulence. The "Burgundy" is a charming two-bedroom suite uniquely designed to make you feel a world away. The unit has an oversized balcony overlooking Dumaine and Bourbon St. Located in the heart of the French Quarter, our Conti suite has been recently restored in the gorgeous 1820 French Quarter Mansion. Once the attic of the single family mansion, the Barracks can accommodate up to 8 guest and features 2 bedrooms, 1 full equipped kitchen, 1 vintage bathroom with an original refinished clawfoot tub and an exposed pipe brass shower. Step into a delicious, eclectic European fairy tale without leaving the United States. The French Quarter, also known as the Vieux Carré or the “Quarter” to locals, is the oldest neighborhood in New Orleans with Spanish and French roots dating back to the 17th century. The French Quarter unique attractions is the reason why is the most visited area by both locals and tourists. From the beautiful architecture to art galleries, museums, restaurants, and bars, the French Quarter has something for everyone – no matter what your interests, budget, or age may be. Join up with a tour and learn more about the fascinating history of the area, or spend the entire day exploring and shopping in the area, topping everything off with an excellent meal in a world-famous restaurant and some live music. With so much culture, history, and entertainment, you’ll find a unique and exciting experience around every corner. Download our local guide to see our suggestions of the best places to eat, do and see in New Orleans to experience its unique vibe.